We’ve lived in our house for nearly six years and for all of those we’ve wanted and needed to renovate our porch. It had slowly become a dumping ground. It’s actually pretty incredible what you can fit in such a small space. This wasn’t a vanity project. Our wooden door frames were slowly falling apart but the expense was slowing us from doing anything about it. We’d decided we wanted Crittall doors as we wanted doors that would add more character to the house rather than traditional wooden doors. We were soon sent to plan B when we realised the expense of these – we were quoted £12,000! 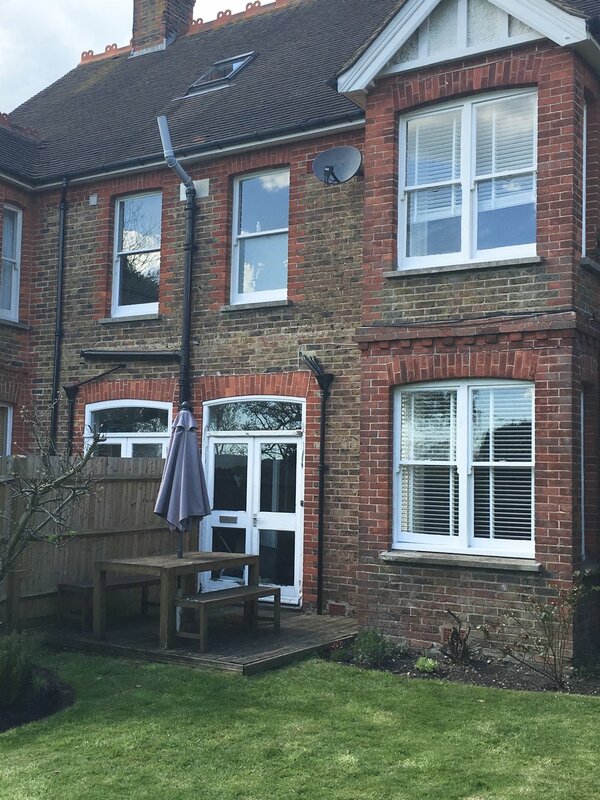 Eventually we found the answer with a lovely company called Met Therm Windows. 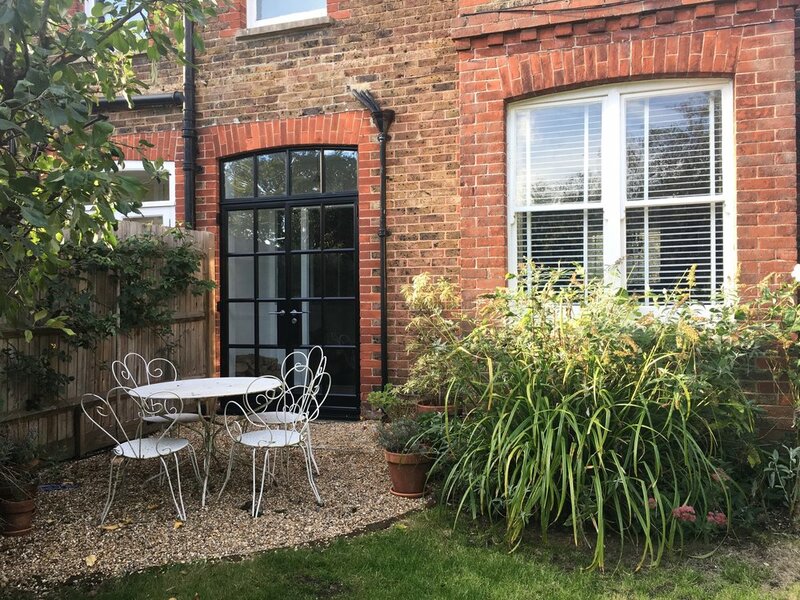 They specialise in double-glazed aluminium windows that look just like Crittall, whist still maintaining the traditional stylish features of your house. They lived up to every expectation – the service was impeccable, the doors look perfect and they were half the price of Crittall. We started the the project a year earlier by transforming the garden area that leads from the porch. It was old decking in a square and it really didn’t suite the shape of the garden or the style of our house. 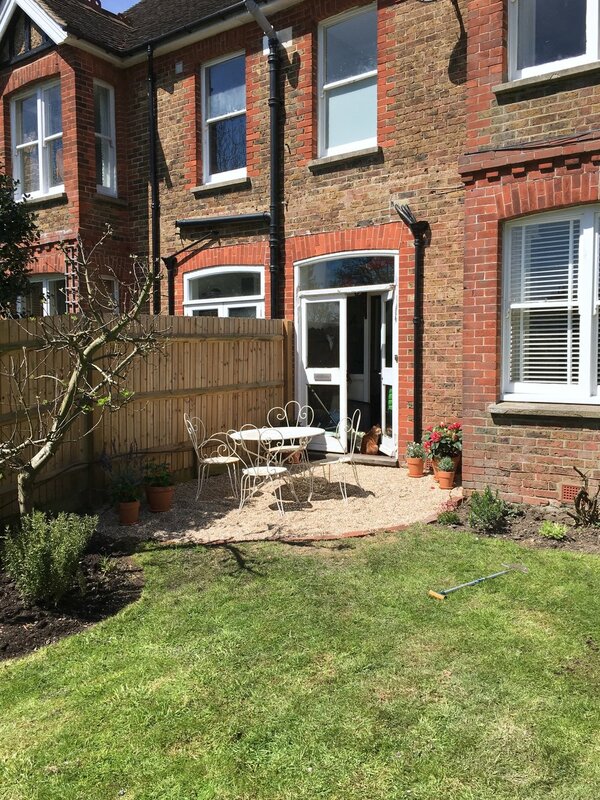 In the true style of my husband, this led to changing the whole shape of our garden and creating soft circular shapes around the bedding areas where the decking used to be. This is now covered in gravel and has French vintage metal garden furniture that we found in one of our favourite local shops Closet and Botts. You can come across these in vintage shops or online. With a few pot plants, a rose bush that crawled along the fence and our morning breakfast area was complete. We had the doors fitted last summer and we then spent (or should I say my husband did) the next month transforming the inside. Next on the list were the tiles. I went around in circles deciding which ones to use. I was determined to go for something with a bit of a wow factor. The Lily Pad Tiles were looking like the firm favourite but I couldn’t help think I would tire of them. In the end my gut feeling said traditional and Victorian. We bought these from Topps Tiles as they were easier than most to to lay. We then had the job of re-plastering the inside as the walls which were tired and cracked. I was a little hesitant at first as it seemed an added expense but my husband insisted, saying it would make all the difference with all of our old Victorian features. Annoyingly he was right. Next we decided on the colour. It was always going to be white but you’ll know if you use Farrow and Ball, that there’s nothing as simple as just white. We went for Wevet in the end which is quite a fresh, cooler white. It’s a very bright room and we wanted to exaggerate that. We also did the woodwork in the same colour. I would have loved to have done this in Railings against all the stained glass but white definitely looked better when you were in the garden and looking through the Crittall doors into the house. We finished off the room with the lighting and fire accessories. Considering the rest of the porch was traditional we kept to the theme with the light fixture and found an Olsen Glass Globe Pendant from Heals. We also wanted a traditional red fire bucket to put the ash in from our real fire and we eventually found one on Ebay. We stacked the logs from the garden against one of the walls and we were finally done!